The esteemed artist Betty Blayton (Taylor) transitioned Sunday morning, October 2, 2016 at Calvary Hospital in Bronx, N.Y. She was 79. A memorial service is planned for some time in the future in New York City. 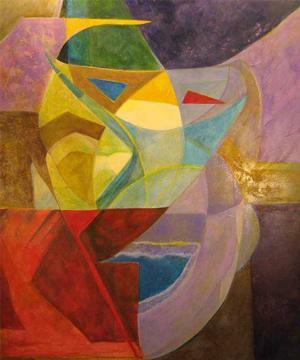 A number of Betty Blayton’s paintings specifically referred to "spirit," "soul," inward ("center") states, and "grace." So she was well-prepared for the release from the physical body to become, in the words of one of her painting titles, a "spirit in space." In addition to creating a large body of art work over more than five decades, Blayton was a path-breaking arts administrator. She was a co-founder and board secretary of the Studio Museum in Harlem, co-founder and executive director of Harlem Children's Art Carnival, and co-founder of Harlem Textile Works. In 2008, the “Spirit Light, Betty Blayton From Center Out” article was published in the print IRAAA journal. The author of the article, Toni Wynn, interviewed Blayton in her Bronx home. In learning about Blayton’s transition, Wynn said: "The connection forged with Betty Blayton on that afternoon in her studio and home never faded; she remained helpful, funny and insightful whenever I contacted her. Betty invited me to do a solo poetry reading during her 2009 show at Strivers Garden Gallery in New York What a generous person, always boosting artists and expanding the network. May we carry the best of her forward by supporting and believing in one another, and by nurturing freedom through working steadily at our craft." My daughter and I left a friends’ Manhattan apartment on a windy morning to ride the train to the Bronx. The February cold was biting and relentless. Once uptown, we took big, fast strides toward Betty Blayton’s home, not lifting our faces to take in the surroundings. No one lingered on the icy streets or in the doorways on Blayton’s block. Betty invited us into a house of natural light. A retrospective of her artwork covered her walls. She showed us Spirits in Space, a piece I’d seen at a small gallery in Virginia just months before, and would’ve bought if I’d had the means. The house felt big, but well-lived-in. Her studio space naturally extended her living space; all was quiet. She’d ordered take-out for our lunch, and there was abundance. Wynn recounts Blayton’s formative years growing up as the free-spirited daughter of the only black physician in Williamsburg, VA, and attending Syracuse University as an art major in the late 1950s. Breaking ground and taking flight has been Blayton’s path for a long time. Her Thoughts Live paintings in the 1960s brought a message that, while uncommon back then, is more easily heard and understood now: the correlation of internal and external realities. She makes reference to spirit, messengers, soul and journeys in the titles of her pieces. You can feel the energy moving, rising, flowing. 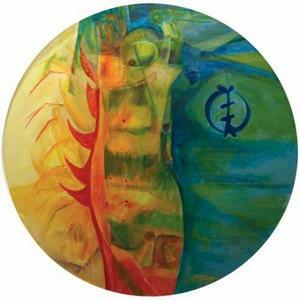 She wants us to take that next step, into self-reflection — going inward to connect with the All. “We are hooked into the universe,” she says. The guides in her own exploration have included the Bhagavad-Gita, Edgar Cayce, Shaki Gawain, Wayne Dyer and Michael Newton, author of Jouneys of Souls. Blayton tries to read something spiritual everyday and calls herself “a spiritual impressionist.” There is so much that Blayton wants us to understand. 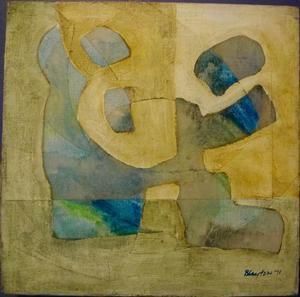 The article goes on to recount Blayton’s experience as an artist in New York City, beginning in the early 1960s when there were only a few professional African American artists; her friendship with Romare Bearden and Norman Lewis; her spearheading efforts to mount exhibitions for black artists in the later 1960s; her involvement in helping to found the Studio Museum in Harlem; and her exhaustive work in performing multiple teaching and administrative functions at the Children’s Art Carnival (which “gave visual substance" to the dreams of young people, including a 14-year-old Jean Michel Basquiat who was living in the subway). In the “The Artist Today” conclusion to the article, we learn how Blayton’s spiritual journey continued though the creation of works such as Spirit Light. Earlier in the article Wynn noted that Blayton wrote poetry to "accompany her visual quest." 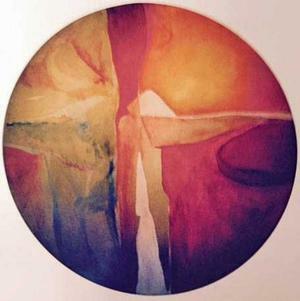 The lines she quoted from a Blayton poem can be applied to her spiritual trajectory on this occasion of her transition to the "celestial self." where all answers are found? The full article, the “Spirit Light, Betty Blayton From Center Out,” is in this IRAAA issue (vol. 22. no. 1). 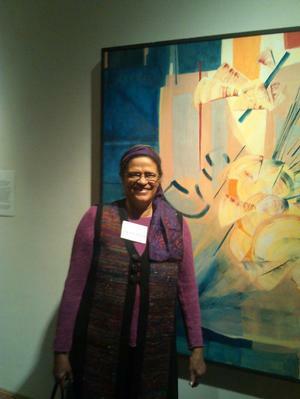 Toni Wynn is a contributing IRAAA writer and museum consultant who lives in Hampton VA. Wynn was later able to acquire the the Spirits in Space painting that she admired when she visited Betty Blayton’s home. 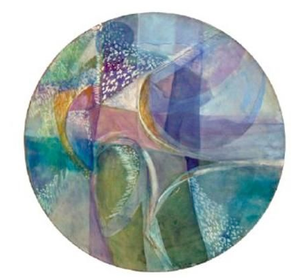 In Search of Grace, Reaching for Center, In Search of the Gap, and Spirits in Space were among the Blayton artworks reproduced in Toni Wynn’s 2008 article. The final two paintings were selected to illustrate this article because of their relevance to Blayton's transition. 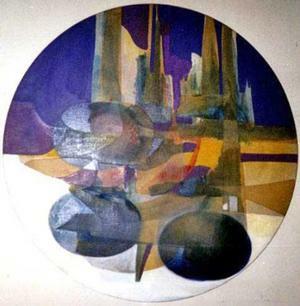 All art work reproductions are courtesy of the estate of Betty Blayton Taylor.